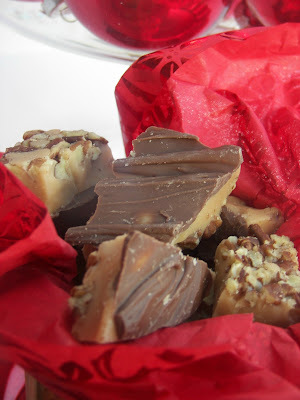 Zoulah and I welcome you to Red Couch Recipes and to Tablescape Thursday. Zoulah and I set our Jolly Jack-O-Lantern table on the deck. Sadly, I think it will be the last table set on our deck this year. The weather here has snapped cold. The stars of the table are these Jolly Pumpkin Scarecrow plates. They make me smile looking a them :). The napkin rings were on clearance at Wal-Mart two years ago. 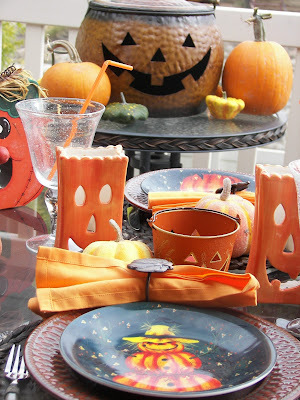 I have stuffed the table and the little table behind with lots of Jolly Jack-O-Lanterns. I go crazy over pumpkins at this time and love to carve them with my family. It's a pretty view through the bubble glasses. Just a long view of the table and the little table behind. An angle shot. 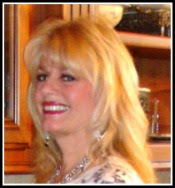 I am loving all the orange and all the Jolly Jack-O-Lanterns. 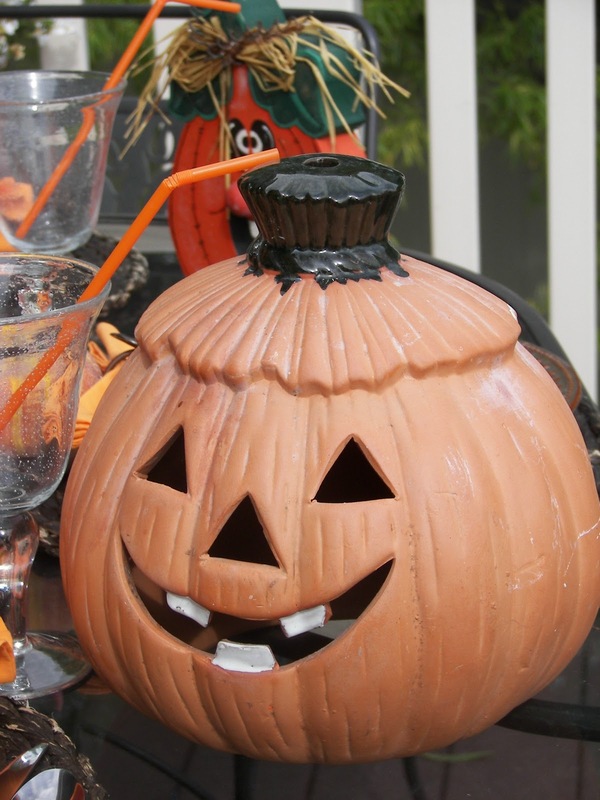 I have had this terra cotta Jack-O-Lantern for at least 15 years. I hope you enjoyed our Jolly Jack-O-Lantern table. Just wonderful! Love all your decorations for all the holidays! You and Zoulah are the best October party girls I know! LOVE your collection of halloween tableware. 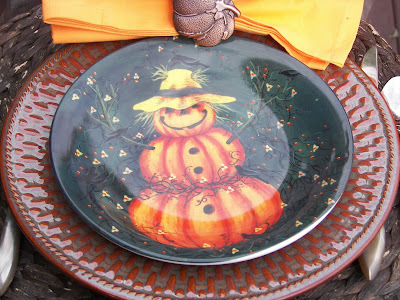 jack-o-lantern plates I have seen...will you tell where you found those little darlings? That sure is a jolly table! How fun it is! 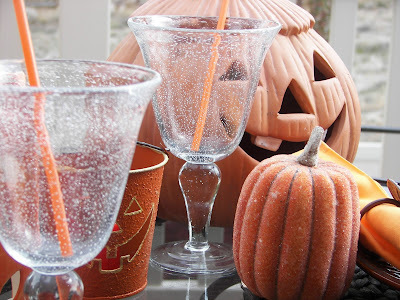 That is the one sad thing about Halloween, it's a sign of the cold weather that is to come! Can't wait to see what you are going to serve here. Such a happy and fun table! I love all of their smiling faces and it is so fun that they are all out of different materials. Love those fun salad plates too. Zoulah and you did a great job. So nice to have the last dinner outside before the cold descends. 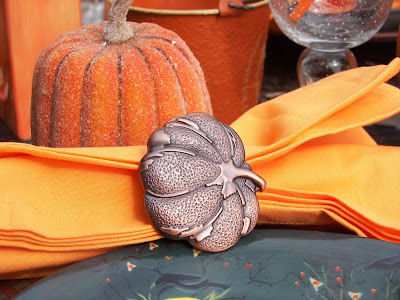 I wish I had seen those sweet little napkin rings! Just too cute. love the entire setting. Thanks for sharing. Joni, I don't know where to start! I love the napkin rings and those cute pumpkin bags and the plates and the little buckets and the seeded goblets with the orange straws. Your whole table is as festive and happy as can be. Thanks for sharing. 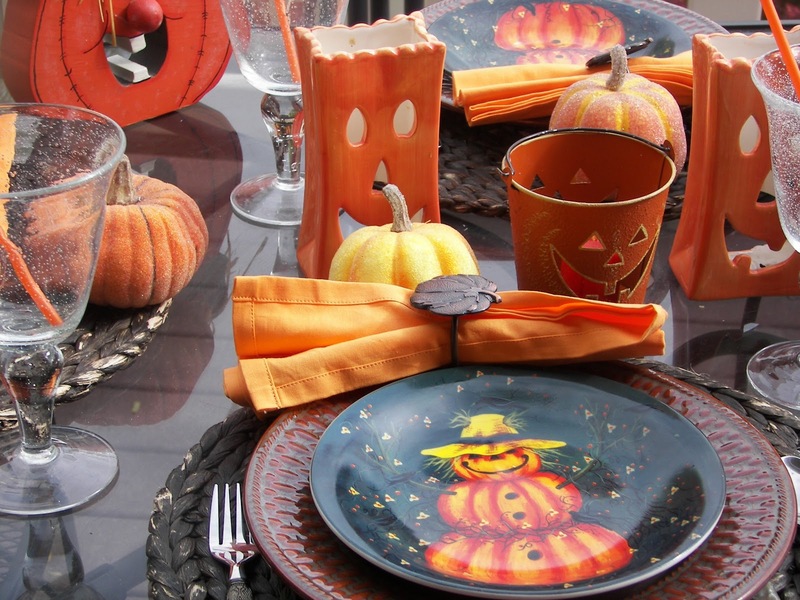 I DO love your jolly jack-o-lantern table! I'm so fond of pumpkins. They are one of the reasons that I love the season. I love all the different ones that you have with shapes and sizes. My favorite shot is the one third from the bottom where you can see the place setting in front of all the pumpkins with the terra cotta one in the background. Just typical Joni whimsy around here tonight. I love it. What a fun collection of jack-o-lanterns! If this is your Halloween decor I can't imagine when Christmas will bring! Visiting from next door at Tablescape Thursday. Girl! You need to send me sme of your energy! You are just on a ball with all of your pretty eye candy! What fun it would be to dine at this jolly Jack table. Love it! The plates made me smile too:) Darling table, Joni! So cute!! Love those scarecrow plates! Please wish Zoulah a VERY Happy Halloween! I'm sure she's looking forward to it! You have an amazing pumpkin collection. So much happiness at your table! Love it! Such an adorable table! 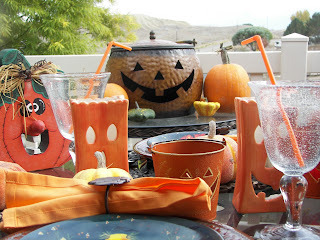 I like seeing all your jack o' lanterns, including the ones in your blog wall paper. I think my favorite on your table is that metal caldron (?). So cute! I love the jack o'lantern plates! What a darling table. Hi, Joni! 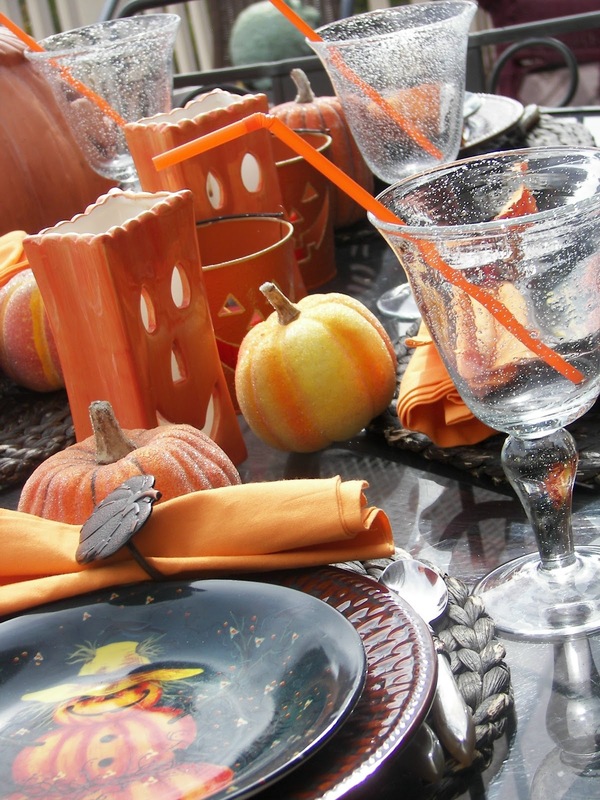 Great Halloween table! The salad plates are really cute!!! Have a Happy Halloween!! Love all your tables Joni. This one is so cute and family friendly.